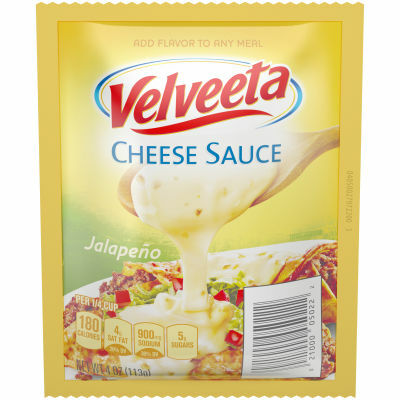 For when you crave a spicy kick, Velveeta Jalapeno Cheese Sauce is there to satisfy them. Add a cheesy flavor to any of your meals with this soft, smooth, and creamy cheese sauce with the kick of real jalapenos. From nachos and to an easy and slightly spicy home made mac & cheese, this cheese sauce is perfect for any dish that calls for quick and convenient cheesy flavor - just melt it and enjoy. 1 4 oz cheese pouch. Serving size 1/4 cup (67g).